Never Pay for Magazines Again! I made a great discovery this morning that I felt I need to share with the world. I try many reward sites, but am often frustrated by how long it takes to cash in for rewards. This morning I tried out Recyclebank and was able to cash in for a 2-year magazine subscription in under 20 minutes! Simply flip through some slideshows about recycling and once you have 300 points or less depending on the magazine, you’re set to cash in. 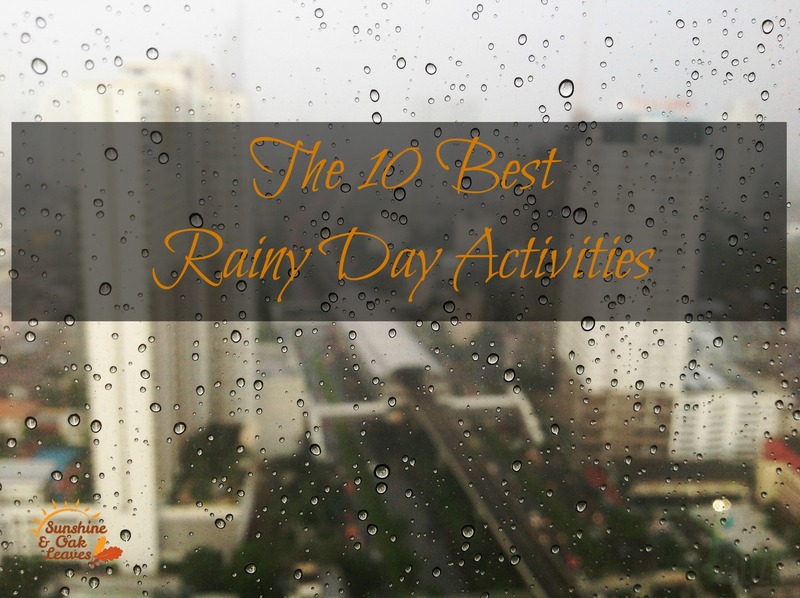 Each slideshow earns you about 30 points, so it really is that easy. How To Try Dollar Shave Club For Free! I began to sign up for Dollar Shave Club, added the package to my shopping cart and created an account, but then stopped because there was a place for a coupon code, so of course I had to find one! Forgetting about it in the meantime, a month later I received an email from Dollar Shave Club with just that. A code for my first month free. So now you know how to go forth, wait them out, and get your first month of Dollar Shave Club for free as well. 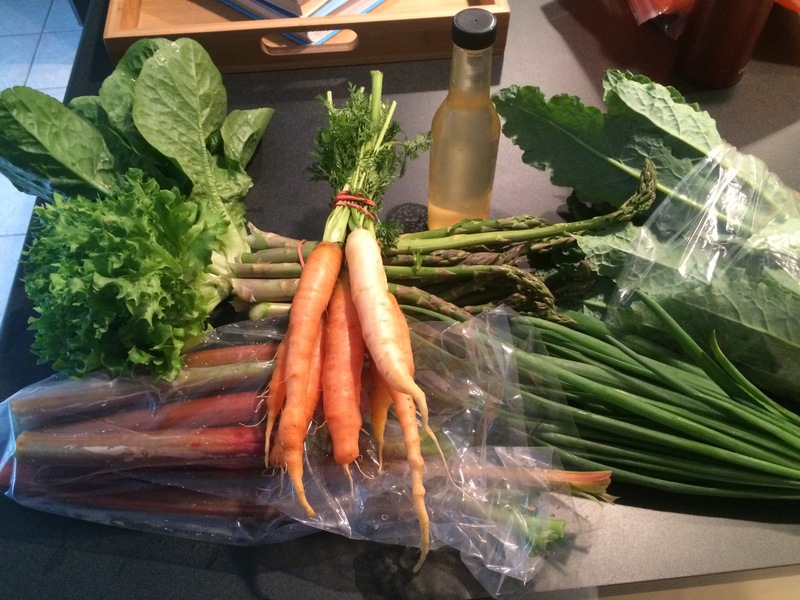 In an effort to eat seasonal and expand our food horizons, my husband and I bought a share in a local CSA. 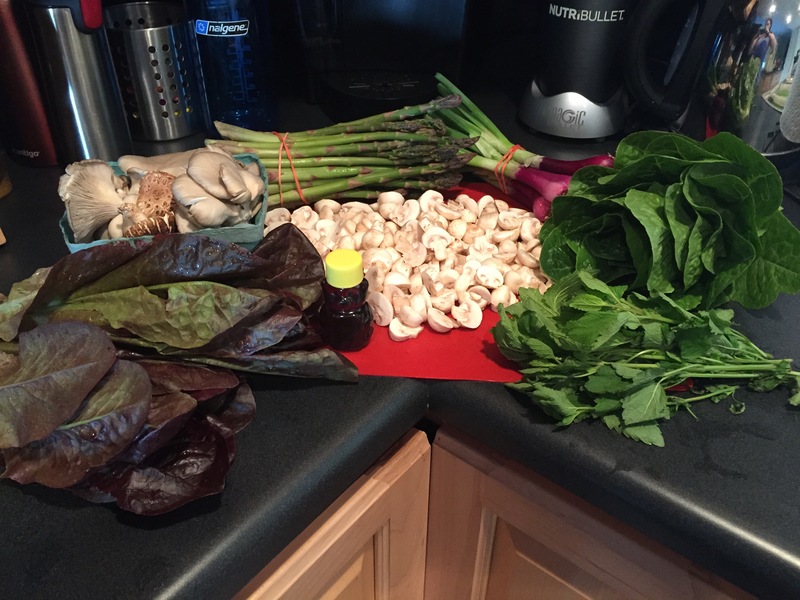 What is a CSA (Community Supported Agriculture)? For a predetermined price, families can buy a share from a local farm and get weekly or biweekly produce “deliveries” over the course of the growing season. It may seem a little pricey up front, but it works out to be a reasonable price per week of your family uses a lot of fruits and veggies. Plus, you’re guaranteeing your produce is local and fresh! To learn more about CSA’s or to find one in your area, check out the Local Harvest website for more info. For each delivery, I’ll be breaking down what we got (mostly seasonal produce) and what we plan to use each item for. Chop garlic and onion then sauté in olive oil until garlic begins to brown and onions are tender. Add kale, water, and paprika. Stir and cover. Bring to a boil then reduce heat and simmer covered for about 20 minutes. Stir in balsalmic vinegar, salt, and pepper. 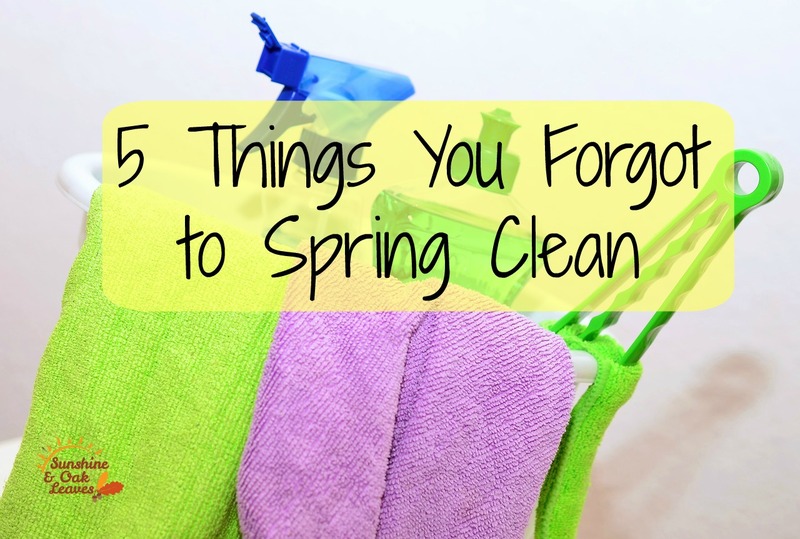 When was the last time you cleaned your pillows? Pillows hold dust and bacteria and although often overlooked, should be cleaned on a regular basis, especially if you suffer from allergies. To clean pillows, put them in your washing machine on the hottest setting along with a cup of laundry detergent and a cup of bleach. Orient your pillows so that the weight is evenly distributed in the machine (only vital for machines with an agitator). Make sure that the pillows are well rinsed (rinse again if needed) and transfer to the dryer along with tennis balls wrapped in socks. These will serve to fluff the pillows and prevent lumps. Dry at low heat until fully dry and you can sleep easier knowing that you’re breathing in cleaner air. Yes, it may be scary, you may find some interesting stuff down there, but this is that time of year. Move the couch and any other furniture that you typically can’t access with your regular routine and get rid of those dust bunnies. Is your prom dress still sitting in your closet even though you know you’re never going to wear it again? 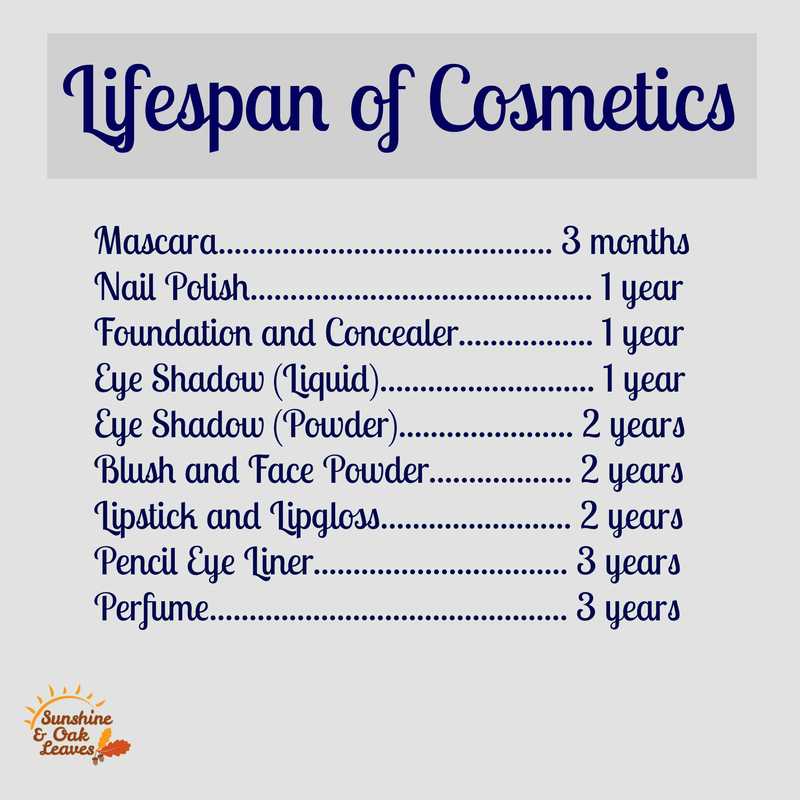 If so now’s the time to get rid of it! You’re just in time to make someone’s prom special by donating your dress to a project like Operation Prom. For the rest of your closet, request a clean out kit from Thred Up (use this link for $10 free spending money! ), fill it up with anything you no longer wear, and send it back (no worries, it’s free shipping). They’ll pay you cash for the clothes you sent and you can use this money to buy a brand new spring wardrobe, or spend it on whatever you want. First off, a huge thank you to Elyse and Celine for letting me share my project with you! I love being able to get creative when there’s some extra time, so this is exciting for me. Anyway, so the project that I tackled, along with some help from my boyfriend, Steve, was making a bar for our first apartment. We spent a few hours shopping online and wandering around stores, only to find out most of our options were too big for the space we had or were quite pricey (or both!). 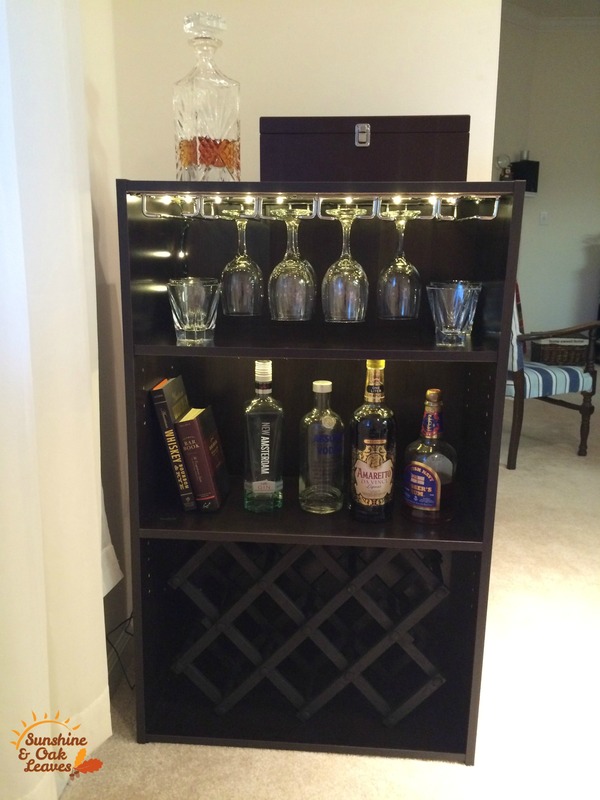 Who knew it was so hard to find a little something that had wine and liquor storage? Instead, we decided to try to save some cash by repurposing something we had already – a standard bookshelf that has the holes and pegs on the side so you can move the shelves around. Steve got it at Walmart for $20 a few years ago. After cleaning all the knick-knacks off, it looked like a pretty blank canvas! 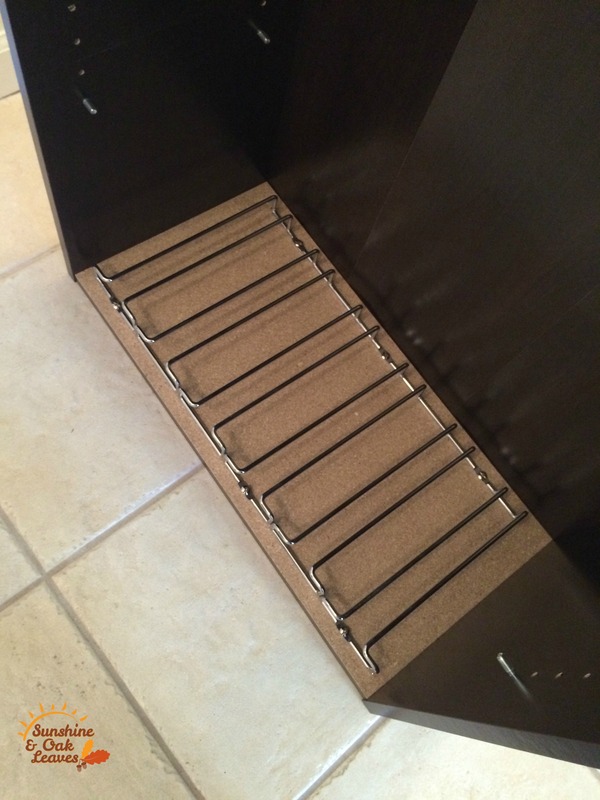 We planned ahead a little, and ordered a wine glass rack that goes under a kitchen cabinet on Amazon. They had lots of different sizes so we could find one that would fit just right. The wooden wine bottle rack Steve found at a flea market a while back for about $3, and was just sitting on the counter taking up a lot of space. Turns out it was just the right size to fit into the bookshelf. Then, just a quick trip to the craft store (only a few minutes away – it’s very dangerous, haha!) and we had the rest of the supplies we needed. Some black paint, foam brushes, a strand of LED lights, hot glue gun and sanding block. 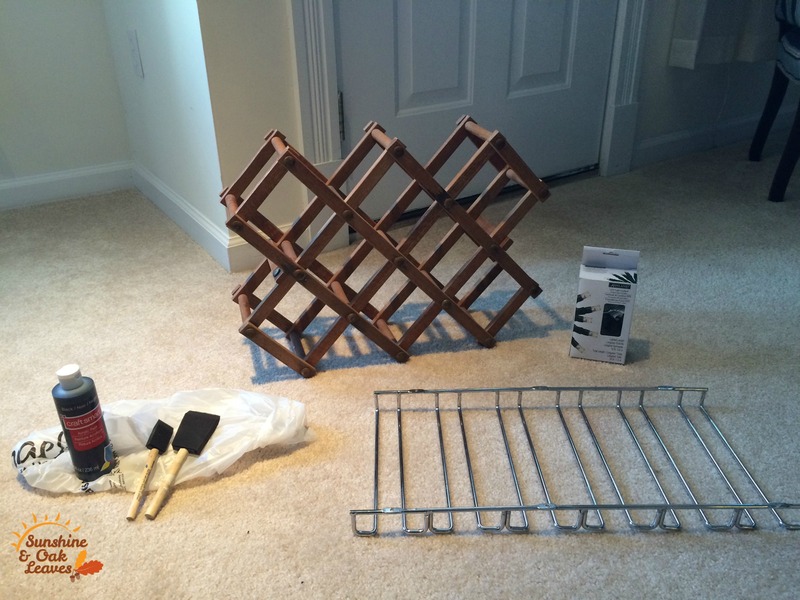 The thing that took the MOST time (by far) was prepping and painting the wine rack. Since the bookcase was a black-brown, I wanted the wine rack to be a similar color so that it looked like the shelf came as a bar. 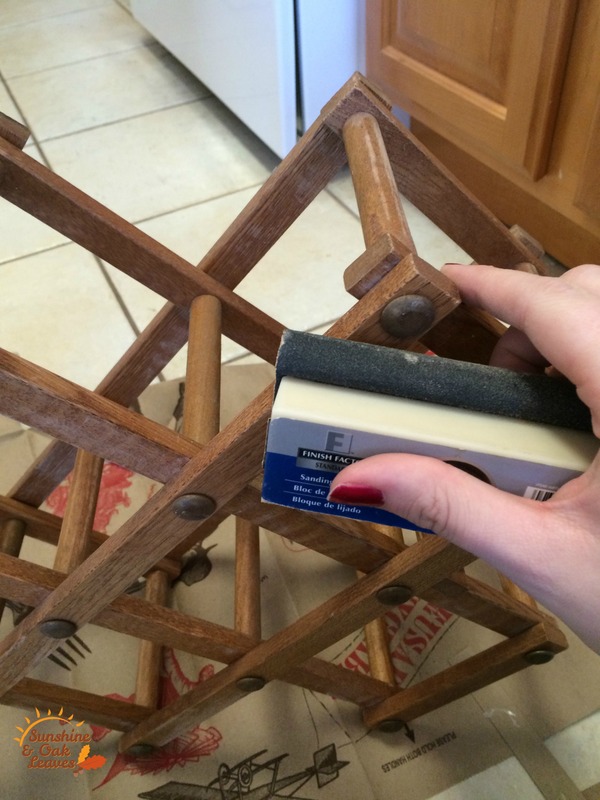 To make sure the new black paint would stick, I did some sanding to take off some of the old finish on the wine rack. I also took off the paint on my finger nails throughout the project, but these things happen. Then I took to painting all the sides of the wine bottle rack. 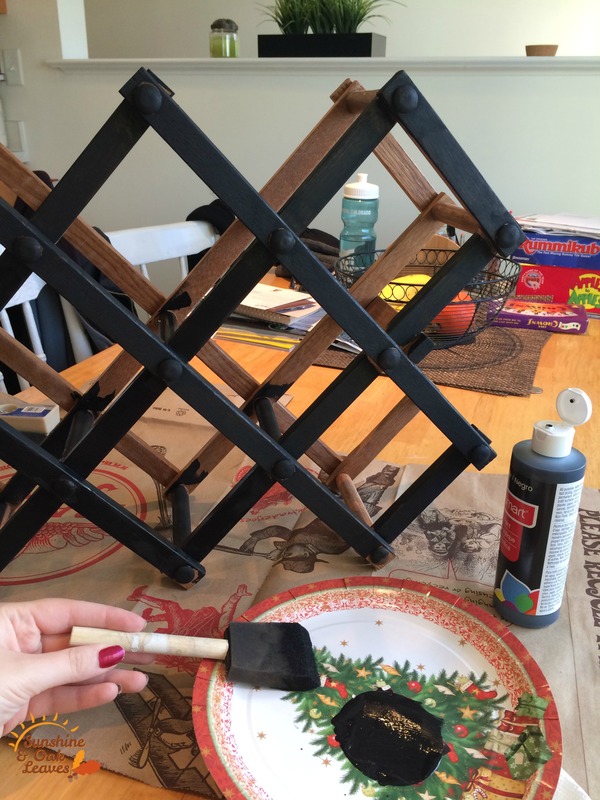 As much as I love the “lattice” look of this thing, I was muttering at it under my breath while painting ALL the sides and pieces of wood. In the end, one coat of paint did the trick, but it still took about 2 hours to get everything covered before doing touch-ups in some of the corners. Meanwhile, Steve took the bookcase, removed the shelves and turned it upside down. The rack for the wine glasses came with some hardware, so all he had to do was screw it onto the underside of the top of the bookshelf. Make sure you have the correct side (the wide side) of the glasses rack facing out, so the opening is facing you and you can actually hang the glasses. We also had to decide exactly where we wanted the moveable shelves to go. We needed enough space for the wine bottle rack to sit in the bottom and we also needed enough room for our wine glasses to hang from the top. We were fortunate enough that this left us with enough space to stand up a normal-sized liquor bottle in the middle. The other feature that we wanted, one of Steve’s more brilliant ideas, was to add lights to the bar. With all the different glasses we have, and the glass of the liquor bottles, we figured it would add a nice touch to have the underside of the shelves light up. So his next task was laying out the LED light strand we bought. Turns out that just one strand was enough to put lights on 2 of the 3 shelves. Now, there are many ways to get these lights in place. 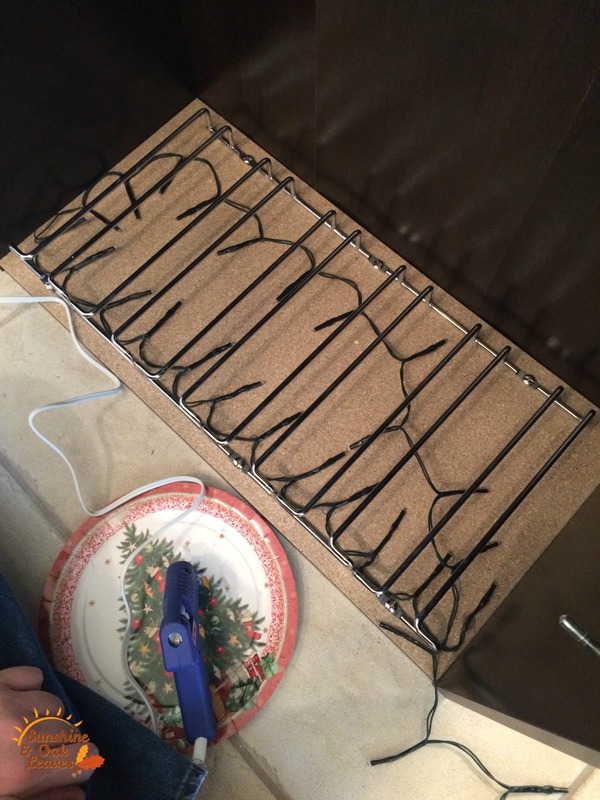 We thought about mini command hooks so that we could switch the strand out if it stopped working. But, seeing as we bought LED lights (partially to control the amount of heat near all the glass) and they have a tendency to last longer, we decided that hot-gluing would stay better on the underside of the shelves. I can’t stress enough how important it is to lay everything out before you start sticking things down! Luckily, Steve is very good with this, and he knew how many lights he had for each shelf and how he was getting from one shelf to the next and to the back of the bookshelf where the electrical outlet is. So he went through and hot-glued everything down. He made all of the lights very flush with the shelf, especially the one with the glass rack, so that the glasses wouldn’t catch on the lights. When he got to the end of the strand, he poked a hole in the back of the bookcase for the cord (close to the underside of the shelf so the hole wouldn’t be seen). This just required some elbow grease for us since the bookcase had one of the faux-wood backs which are pretty thin. But if you are using a sturdier bookcase, you might need a little drill for this part. By this point, I was still painting touch-ups on the wine bottle rack (I told you it took a while!). But after letting it dry, that was the last step! We added in some of our glasses and bottles, we plugged in the lights and voilà! We are still hunting for something to use as a nicer “top”. Maybe a left-over piece of granite or a really big wooden cutting board, but we like it the way it is now too. For only about $20 in supplies (since we already had the bookcase), we made ourselves a little bar that fits perfectly in our new dining room! Now we just need to hunt down some good wine. 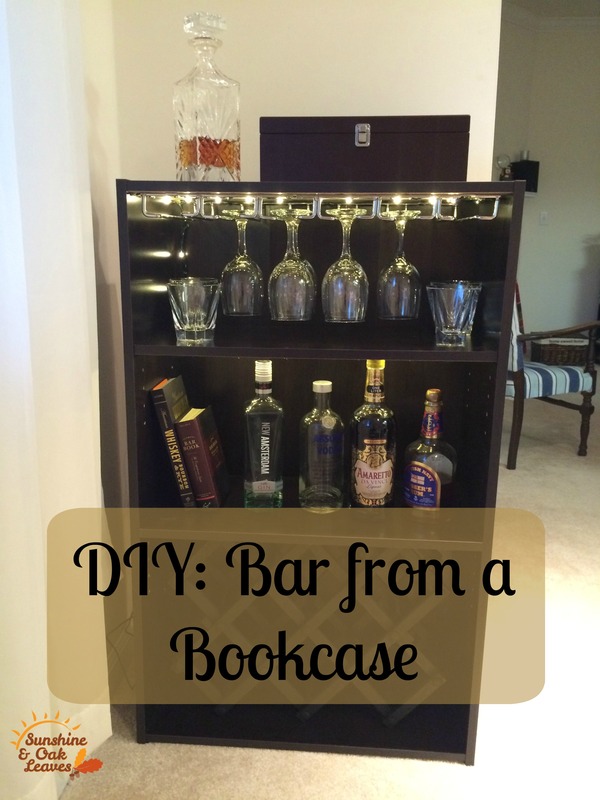 Comment below if you give this DIY a try or if you have made your own bar some other way!